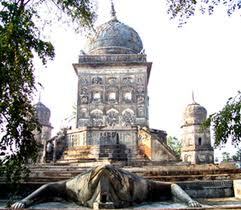 The unique Frog Temple lies at Oel town 12 km from Lakhimpur on the route Lakhimpur to Sitapur. It is the only one of its kind in India based on “MANDUK TANATRA”. It was built by the former king of Oel State ( Distt. Lakhimpur Kheri) in between 1860 to 1870. It is the temple dedicated to Lord Shiva. This temple is built at the back of a large frog in the area 18 x 25 sqr.mtr. The Temple is constructed between an octa-hedral lotus. 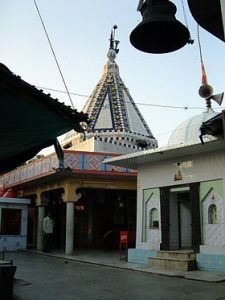 The Shivling installed in the temple was brought from the “BANASUR PRATI NARMDESHWER NARMADA KUND”. The face of the frog is 2 x 1.5 x 1 cub.mtr. towards North. The main gate of the temple opens in the east and another gate is in the south. The archetecture of this temple is based on “TANTRA VIDHYA”. It is the temple dedicated to Lord Shiva. The Gola Gokaran Nath is also called by the name “CHOTTI KASHI” It is the belief of the people that Loard Shiva pleased with the penance (Tapasya) of Rawana (King of Lanka) and offered for a boon. placed anywhere on the way to Lanka, if he will be placed anywhere, he will be settled at that place. Rawana agreed and started his journey to Lanka with the Lord on his head. When Rawana reached the Gola Gokaran Nath ( Gollihara of that time) he felt the need of urinate ( A call of nature). Rawana offered some gold coins to a shepherd for placing the Lord Shiva on his head till he returns. The shepherd could not bear the load and he placed him on the land. Rawana failed to lift him up by all his efforts. He pressed him on his head with his thumb in full anger. The impression of Rawana’s Thumb is still present on the Shivling.